Two new Jackie Chan movies in one month! Yes indeed (Railroad Tigers is the other). 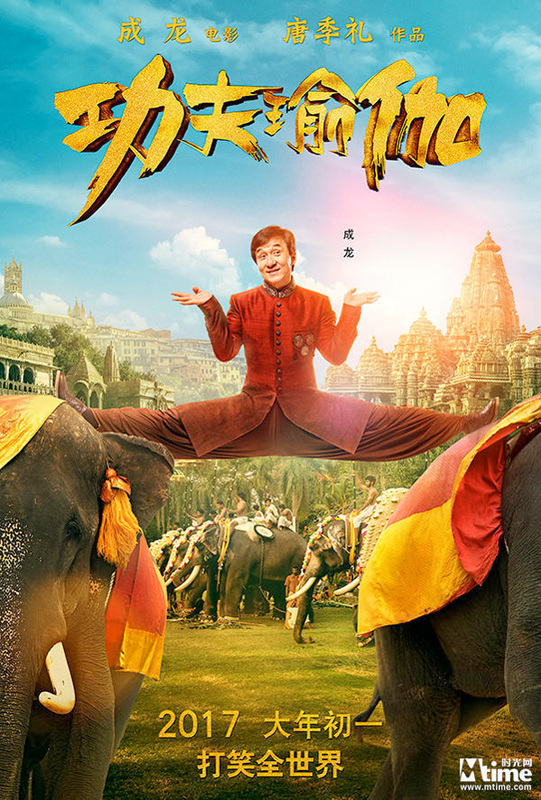 Well Go has debuted an official trailer for the action comedy Kung Fu Yoga, starring Jackie Chan, directed by Stanley Tong. When I was younger, one of my favorite Jackie Chan movies was Rumble in the Bronx, an R-rated action comedy set in Brooklyn and it was awesome. Kung Fu Yoga reunites Chan with Supercop and Rumble in the Bronx director Stanley Tong for the first time in years. And as much as I would hope that was a good thing, this looks terrible. The cast includes Amyra Dastur, Aarif Rahman, Sonu Sood, Disha Patani, Lay Zhang, Eric Tsang. It's an India-China co-production and looks like a CGI-fest. But, the trailer is still fun. Jack (Jackie Chan), a world-renowned archaeology professor, and his team are on a grand quest to locate a lost ancient Indian treasure when they are ambushed by a team of mercenaries and left for dead. Using his vast knowledge of history and kung fu, Jack leads his team on a race around the world to beat the mercenaries to the treasure and save an ancient culture in this breakneck action-comedy. Kung Fu Yoga is directed by Hong Kong filmmaker Stanley Tong, of Police Story 3: Supercop, Once a Cop, Rumble in the Bronx, Police Story 4: First Strike, Mr. Magoo, China Strike Force and The Myth previously. Well Go USA will open Kung Fu Yoga in theaters worldwide starting January 27th later this month. Anyone interested? Eh. Just makes me want to watch some Stephen Chow. Can't wait! Stanley Tong and Jackie Chan are great together! For me this is the first must-see film of 2017.